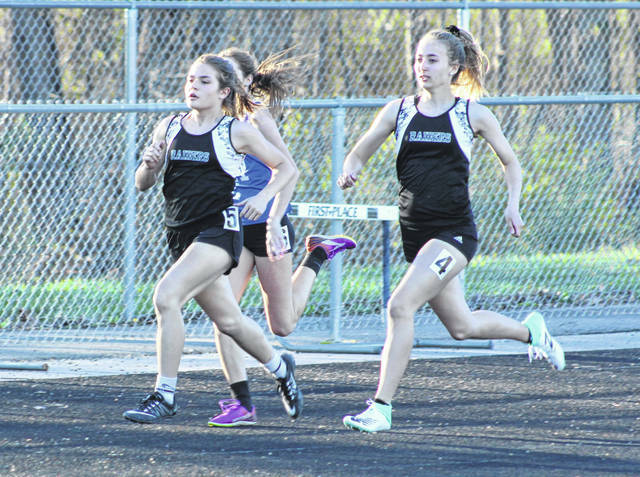 The River Valley duo of Lauren Twyman (5) and Savannah Reese (4) both hit full stride during the 800m event held Monday night at the 2019 Gallia County Meet in Bidwell, Ohio. Gallia Academy’s Logan Blouir, right, keeps pace with River Valley’s Brandon Call (1) and Dylan Fulks (2) during the 800m event held Monday night at the 2019 Gallia County Meet in Bidwell, Ohio. BIDWELL, Ohio — A clean sweep on the home front. The River Valley track and field teams combined for half of the 34 events titles and cruised to a pair of team championships on Monday night during the 2019 Gallia County Meet held on the campus of River Valley High School. Both the Raiders and Lady Raiders defeated their respective fields by at least a dozen points, with the hosts claiming 10 girls titles and another seven crowns on the boys side en route to a pair of double-digit triumphs. The Lady Raiders posted a winning tally of 127 points in the girls meet, with Gallia Academy placing second with 99 points. South Gallia (16) and Ohio Valley Christian (7) rounded out the final two spots in the girls competition. 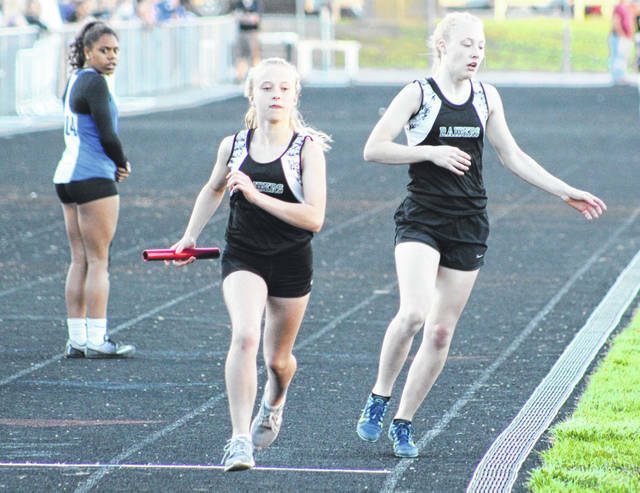 RVHS won half of the four relay events and also had a multiple event winner in Lauren Twyman, who captured first place in both the 100m dash (13.56) and 800m run (2:42.56). Gabirelle Gibson won the 100m hurdles with a time of 17.70 seconds, while Hannah Culpepper won the 1600m run with a mark of 6:45.42. Savannah Reese also captured the 400m dash title with a time of 1:04.15. Elisabeth Moffett won the discus event with a heave of 97 feet, 5 inches. Kelsey Brown was the shot put champion with a throw of 32 feet, 9 inches. Taylor Huck also set a new school record by winning the pole vault crown with a cleared height of 8 feet, 4 inches. The quartet of Culpepper, Julia Nutter, Brooklin Clonch and Abigail Stout won the 4x800m relay with a time of 12:27.32. The 4x400m relay squad of Reese, Twyman, Rakia Penick and Kate Nutter also posted a winning mark of 4:47.29. The Blue Angels came away with six event titles, including a pair of relay wins. Gabby McConnell won the 100m dash with a time of 52.75 seconds, while Zoe Smith won the 200m dash with a mark of 28.80 seconds. Calista Barnes was the high jump champion with a cleared height of 4 feet, 8 inches. Alex Barnes was also the long jump winner with a distance of 15 feet, 5 inches. The 4x100m squad of Gabby McConnell, Gretchen McConnell, Asia Griffin and Alivia Lear posted a winning time of 56.89 seconds. The same foursome also won the 4x200m relay with a mark of 2:01.16. Jessica Luther captured the lone individual title for South Gallia as the senior won the 3200m run with a time of 15:16.35. The Lady Defenders didn’t have an event champion, but Leticia Araujo was the program’s top finisher after placing second in the long jump with a distance of 13 feet, 11 inches. It is the second consecutive season in which the Lady Raiders have been crowned Gallia County champions. 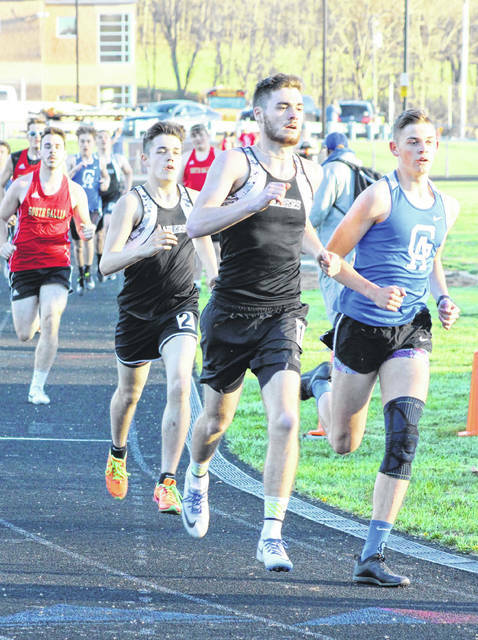 On the boys side of things, the Raiders won seven events and claimed their first Gallia County title by posting a winning tally of 112.5 points. The Blue Devils won eight events and placed second with 100.5 points, while the Rebels notched two event titles and finished third with 27 points. Ohio Valley Christian did not participate in the boys competition this season. RVHS won three relay events, starting with a winning mark of 9:17.49 by the quartet of Rory Twyman, Brandon Call, Dylan Fulks and Caleb McKnight in the 4x800m relay. Trevor Simpson, Cole Young, Nathan Cadle and Jared Reese teamed up for championships in both the 4x100m relay (47.89) and 4x200m relay (1:40.60). Fulks captured a pair of individual crowns in the 1600m run (5:10.73) and the 3200m run (11:45.63). Young was also first in the 200m dash with a mark of 24.88 seconds. Eric Weber won the discus title for the Raiders with a throw of 125 feet, 10 inches. The Blue Devils won the 4x400m relay event as Jonathan Griffin, Tristin Crisenbery, Blake Skidmore and Briar Williams posted a winning mark of 3:44.26. Ian Hill won a pair of crowns in the 110m hurdles (17.55) and 300m hurdles (43.28), while Briar Williams claimed titles in both the 100m dash (11.77) and 400m dash (54.12). Logan Blouir won the 800m run with a mark of 2:15.80, while Coen Duncan claimed the pole vault title with a cleared height of 10 feet, 6 inches. Riley Starnes was also the shot put winner with a heave of 43 feet, 6.75 inches. Kyle Northup secured a pair of event titles for South Gallia after winning both the high jump (5-8) and long jump (17-10). Visit baumspage.com for complete results of the 2019 Gallia County Meet held Monday at River Valley High School.